The Vigor 2952 is a router & firewall sporting two Gigabit Ethernet WAN ports which provide load-balancing or fail-over across both connections. WAN port 1 can be selected as either standard ethernet RJ-45 or SFP format for fibre connectivity. For the LAN ports there are 4 x gigabit RJ-45 ports for connections to various swicthes and VLANs etc. 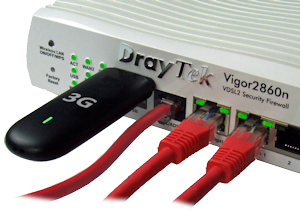 The router runs the DrayOS operating system, providing familiarity for users of other existing DrayTek products. The DrayTek firewall offers extremely high levels of security and protects against attacks including IP-based DoS (Denial of Service) attacks and access by unauthorised hackers and intruders. Wireless, Ethernet and VPN are also protected by further, bespoke systems. The DrayTek object-based firewall allows for greater levels of configuration than ever before, enabling you to create combinations of users, rules and restrictions to suit multi-departmental organisations and requirements. The Vigor 2952 can also allow selective direction firewall rules of LAN to WAN, WAN to LAN & LAN to VPN. As well as this, QoS (Quality of Service Assurance) can now be selectively applied to specific users and rules. For mission critical situations an additional Vigor 2952 can be set up in high-availability mode - also known as 'hardware failover' to mirror the service across an additional or the same connections. This removes the risk of the Vigor 2952 being a single point of failure if it ceases operation or is damaged - the standby router takes over operations automatically. The Vigor 2952 content control features allow you to set individual restrictions on various website access, such as blocking download of certain file or data types, blocking specific web sites with whitelists or blacklists, filtering IM/P2P applications, or other potentially harmful or wasteful content. Restrictions can be per user, per device, or both. With the DrayTek GlobalView service, you can block different categories of web sites (e.g. gambling, adult sites etc. ), subject to an annual subscription provided by the Cyren Globalview service, which is continuously updated to contain newly released sites or sites that have recently been compromised with malware etc. A free 30-day trial is included with your new 2952. The Vigor 2952 ships with user management allowing for conditional internet access to different users based on their own unique login (stored in the router, or by external Radius server) which also can be linked to the inbuilt content filtering system. The Vigor 2952's USB port can (as shown on the Vigor 2860 above) host a compatible 3G/4G/LTE USB modem for access to the cellular network for full Internet Access as primary or failover connectivity for your internet or other services. The Vigor 2952's USB ports can also be used as a storage device by using a USB memory stick on which to store data saved across the network. That memory can be used for recording syslogs or accessed as a simple FTP/file storage for users, local or remote (password protected). 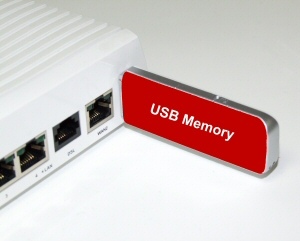 This requires a USB memory stick (up to 64Gb, FAT32 formatted) to be inserted in either or both USB ports. The Vigor 2952's two RJ-45 WAN interfaces can be used either for WAN-Backup or be load-balanced. Each of the 2 WAN Ethernet ports can be connected to any Ethernet-based Internet connection, such as a DSL modem, cable modem, leased line etc. WAN1 port can use an SFP module for direct fibre connectivity. In Load-balancing mode, the router distributes the Internet traffic across all available connections to optimise use of your total available bandwidth. This can be either automatic, according to rules or by reserving specific WAN connections for specific users, devices or services. WAN-Backup provides a contingency (in the form of having a fully redundant comnnection to failover to) in case your primary connection or ISP sufferers a temporary outage. The Internet Traffic will then be temporarily routed via the second, third or fourth Internet connection. When normal services is restored to your primary line(s), the traffic is switched back. The Vigor 2952 allows for up up to 100 simultaneous VPN tunnels to remote offices or from remote teleworkers. The Vigor 2952 supports industry standard protocols, including many widely-used encryption and authentication methods. Teleworkers can authenticate directly with your LDAP server if preferred to minimise administration of passwords such as using your existing Windwos Active Directory infrastructure and logins. The Vigor 2952 also supports VPN trunking which allows the creation of tunnels across muliple WAN connections to a single remote site to load-balance traffic and, therefore increase bandwidth. VPN trunking also provides failover (backup) of your VPN route down a secondary WAN connection, this can be combined with having redundant routers also to erradicate single points of failure. The Vigor 2952 also supports the more popular SSL VPN now. These are encrypted tunnels linking you to your main office but they are 'clientless' in that your computer does not generate the tunnel and you do not need any VPN software. You instigate an SSL tunnel using your web browser and you could be in a web cafe or guest network. Another advantage is that the tunnel is creating using SSL technology - the same encryption that you use for secure web sites such as your bank, and so the traffic is accepted through normal firewalls for hotels etc. rather than being blocked as VPN traffic often is. The Vigor 2952 can operate SSL VPNs in either Proxy or full tunnel mode and allow for up to 50 simultaneous incoming users. For SSL VPN tunnel mode Windows OS, Mac OS X, Apple iOS and Android are supported.